Capital Link’s 18th Annual Greek Investor Forum will take place at the Metropolitan Club in New York City on Monday, December 12, 2016. Greece has been going through a time of unprecedented difficulty and change, as the country restructures its economy and strives to embark on a period of renewed growth and stability. A lot of progress has been achieved, but there are still significant challenges ahead. Developments in Greece have far reaching implications for the European Union and the global economy. This Forum will provide the audience with a unique blend of informational, marketing and networking opportunities. December mark’s the 18 year milestone of Capital Link’s commitment to raising awareness about Greece as an investment destination, to a wider investor universe. Held in cooperation with the New York Stock Exchange, this Forum is a collaborative event. Major global investment banks, as well as U.S. and international organizations allow Capital Link to provide forum participants with a comprehensive review of government reforms, policies, and objectives. Looking to the future, it will underscore both new and ongoing government and private sector initiatives meant to attract direct investment in Greece. An extensive network of key businesses, companies, investment communities, and government officials will also be at attendees’ disposal as will speakers, sponsors, and guests. In doing so, Capital Link remains committed to its aim of raising awareness about Greece as an investment destination to a wider investor audience. 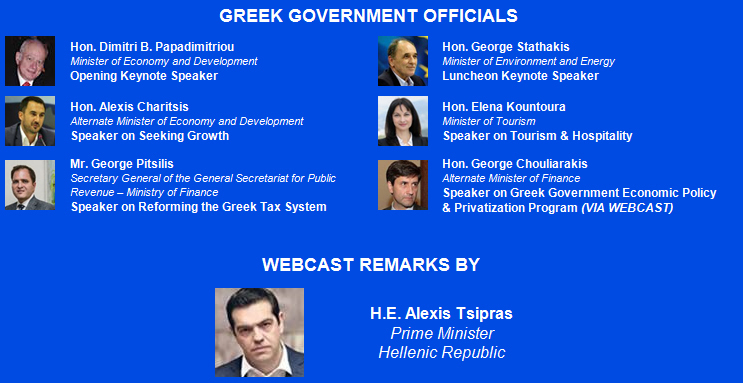 The conference will feature the developments and reforms in the Greek economy and the Greek government programme for the economy and investments. Also, the latest trends in the capital markets and specific sectors with topics such as Government and Corporate Bonds, energy, infrastructure development, real estate, tourism, banking, non-performing loans management, and global shipping. The Forum is organized in cooperation with the New York Stock Exchange, and major global investment banks: Citi, Bank of America Merrill Lynch, BNP Paribas, Credit Suisse, Deutsche Bank, Goldman Sachs, UBS , and the Greek Investment Bank Axia Ventures Group. The Ambassador of Greece to the USA, Hon. Haris Lalacos will provide the opening remarks to the Forum, which is supported by the Consulate General of Greece in New York and represented by the Consul General, Hon. Dr. Konstantinos Koutras. • Public Power Corporation S.A.
• WL Ross & Co. The "2016 Hellenic Capital Link Leadership Award" will be presented to Mr. Wilbur Ross, Chairman & CEO of WL Ross & Co for his outstanding contribution to Greece, during an official dinner at The New York Yacht Club on Monday December 12th, 2016. 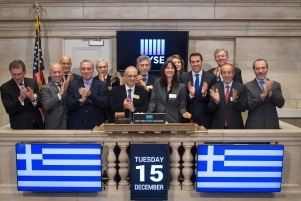 On Tuesday, December 13th, 2016, we will celebrate "Greek Day at the New York Stock Exchange" where the Greek Delegation, Greek companies listed on the New York Stock Exchange and companies which participated in the forum will ring the Opening Bell at the New York Stock Exchange, an event of unique visibility throughout the world. The event will be broadcast live on major news stations in the United States and abroad to an audience of millions of viewers worldwide. For sponsorship opportunities please contact: Nicolas Bornozis or Olga Bornozis or Anny Zhu at funds@capitallink.com or +1 (212) 661-7566.